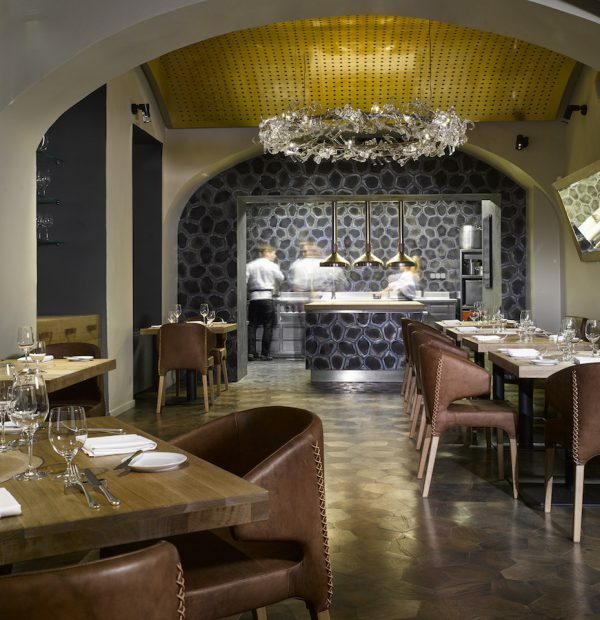 Nestled amongst Prague’s Bohemian streets steeped in history lies La Degustation Boheme Bourgeoise, a small and intimate Michelin Star restaurant of gourmet old-Czech cuisine based on 1880s recipes. 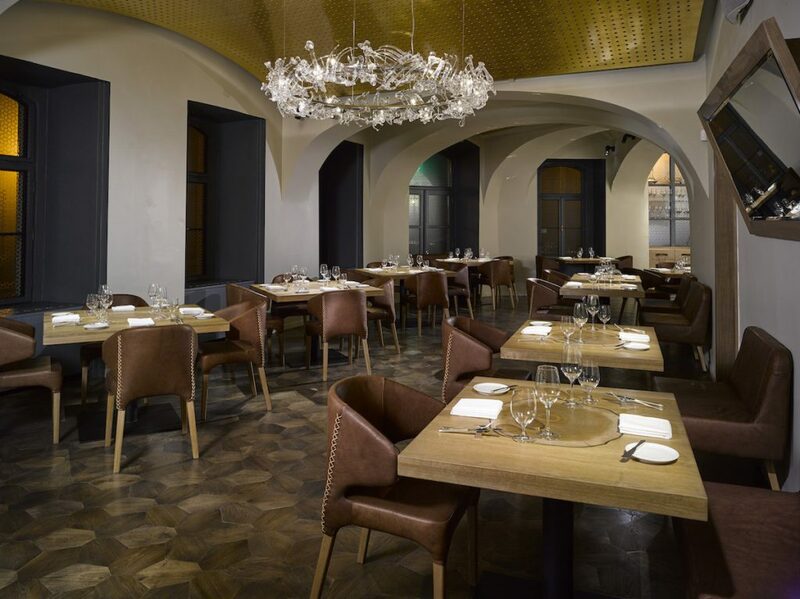 Modern and minimalist in style with soft lighting illuminating its dark wooden decor, this 40-table capacity restaurant screams ultra sophisticated dining, in its aesthetics, service, and menu. Despite its Michelin title, it is however, boldly warm and modest in the best of senses: upon arrival, one is greeted as if by an old friend, taken to the table, cared for, and attended to, yet treated respectfully with a hands-off approach that is refreshing from the usual sense of being watched that one suffers in similarly high-end establishments. 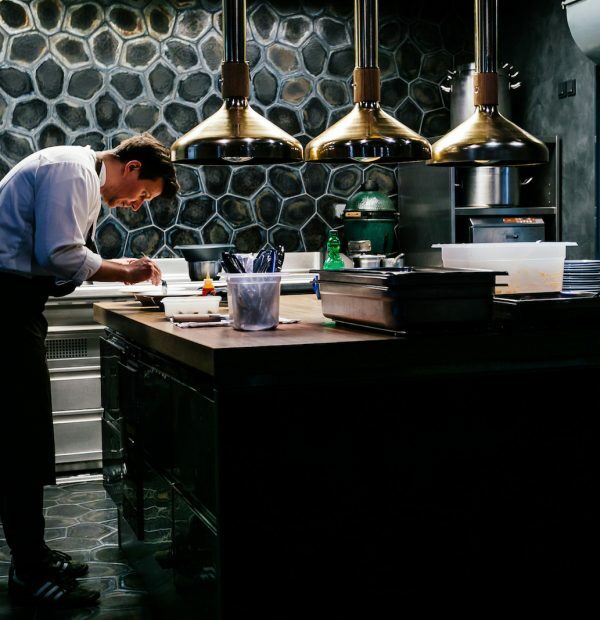 With its open plan kitchen for guests to see the chefs at work, L shaped room to create intimacy, and generously hospitable service, La Degustation Boheme Bourgeoise is familiar with impressing its guests, and it is this effortlessness that seeped throughout our entire dining experience. 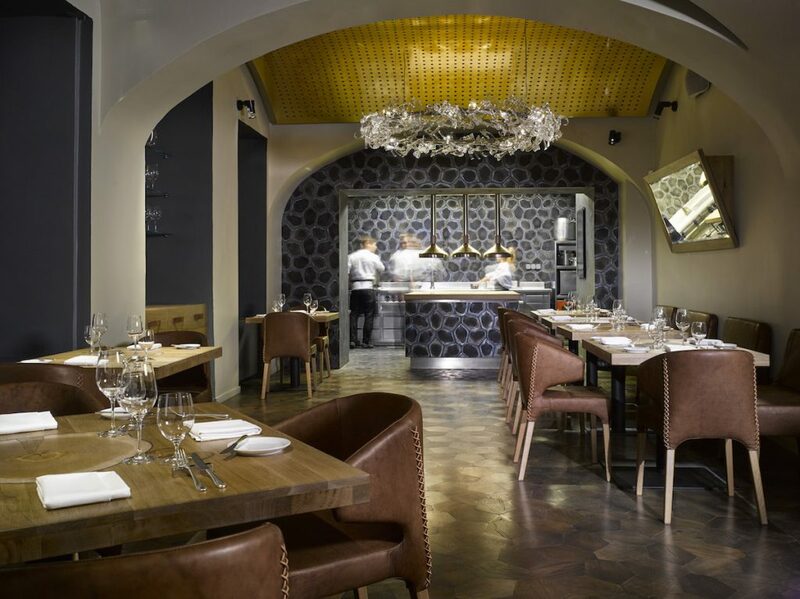 The concept behind La Degustation Boheme Bourgeoise is one of refined Czech dining, whereby the emphasis is almost wholly upon the fare. The intention is to provide an extraordinary foodie experience. 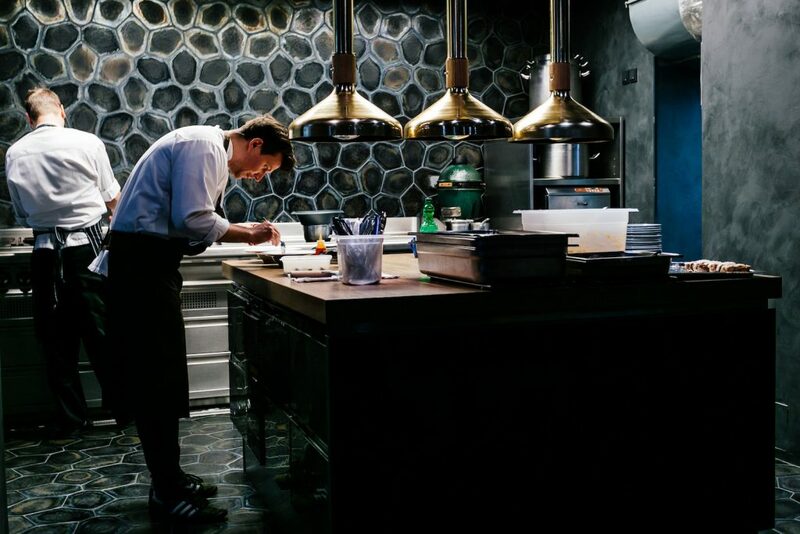 With only the option of two tasting menus, one of six courses, and one of eleven, the food changes almost daily and caters to the seasons. Based on the freshest seasonal ingredients from local Czech farms and producers, each course is small, curious, and complex. Despite the deceptively frugal appearance, however, this is rich food for thought. This is not a meal to eat unconsciously with vigorous conversation, but one to focus on, take time over and attend to carefully. Foodies of the world, rejoice. 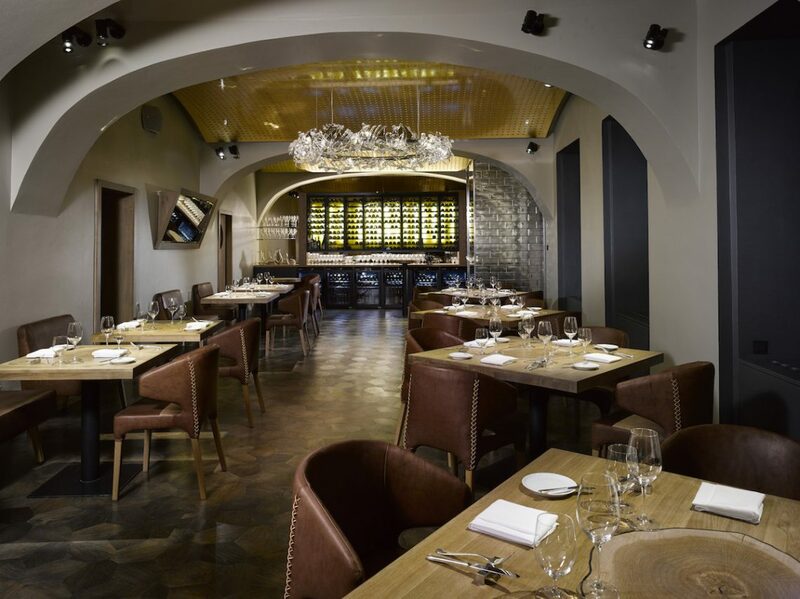 And so, whilst Czech cuisine is typically heavy, potato and meat laden, with oozings of rich cream that is capable of overwhelming the appetite for days, La Degustation Boheme Bourgeoise offers a lighter touch. We began with an amuse bouche of mixed vegetables – roasted courgettes, baby new potatoes, and tiny pickled beetroots – to dip into a light foam dip. Sumptuously salty, this wetted the appetite wonderfully before we tucked into our second amuse bouche of a delicate beef tartar nestled in a wafer akin to a tiny sandwich. Seasoned well, this was an exceptional beginning to the meal as one of the finest beef tartars we had tried. The bread basket too, was delicious upon arrival, served warm as a small crusty loaf of wholegrain brown goodness with kefir butter to pair. Before even the first course, the intricate detail of La Boheme’s cuisine was clear. We began with a Kir Royale for my guest, and a glass of Blanc de Blancs champagne for myself. For our first course, we had tomatoes, mustard and strawberries in a surprisingly moreish combination of mustard ice-cream, littered with crunchy toasted seeds, over strawberry glazed tomato slices. True to the intentions of the restaurant, each bite demands focussed attention as one finds oneself taken aback by the intricate combinations that are overwhelmingly delicious (I can still recall the tastes even now). To pair, we enjoyed a local dry white Bavarian wine calld Mopr, 2016 vintage, from a region called Velke Zernosky, where local indigenous grapes grow. Though wine tourism is relatively a new phenomenon in the Czech Republic, the nation produces excellent wine akin to the Austrian and Germanic varieties, well worth trying. The second course was a carby combination of cauliflower, potatoes, and tartar sauce. Brilliantly green in colour, the tartar sauce covered the crispy roasted cauliflowers and was topped with crunchy potato crackling, creating an interesting texture. This was a delicious dish redolent of my favourite childhood dish in Slovakia of fried battered cauliflower, but crispier, with far more sophisticated flavours, but no less satisfying. To pair, we had the Sedy pinot 2015, by Jakub Novak, a variety of pinot noir blended with an indigenous grape, from a young producer from Znojmo whose wines are individual, complex and ranked among the most interesting ones in Moravia. 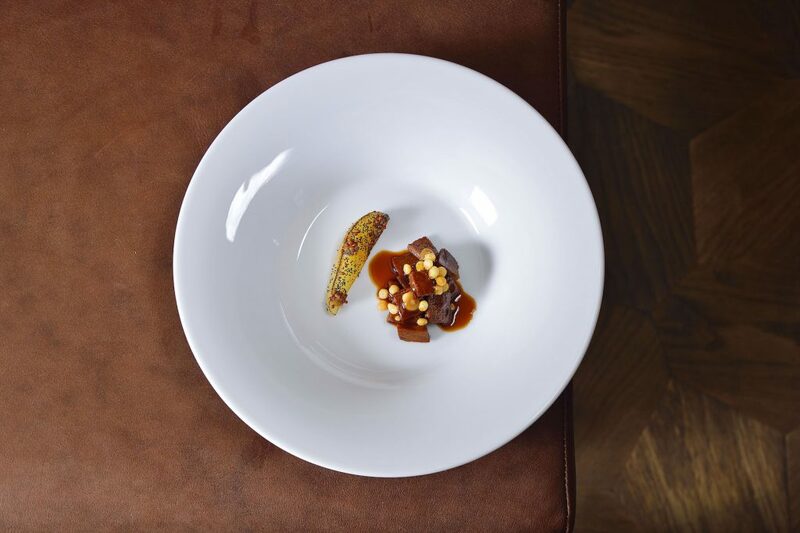 The third course was a beautiful dish of roasted bell peppers, glazed with a fresh and sweet tomato sauce, balanced by the clean flavours of celery root. We enjoyed this with Hibernal 2015, by Petr Kocarik. This was akin to a lovely Semillon, creamy and rich enough to stand up to the roasted flavours of the peppers, yet with a lovely intensity of citrus, melon and grapefruits that complemented the earthy flavours. 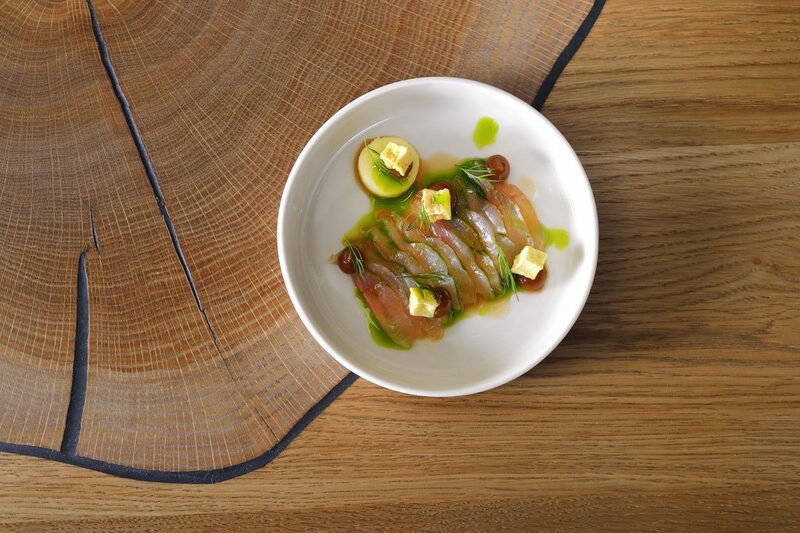 Our fourth course was a firm and flavourful trout dish served with almonds and kohlrabi. 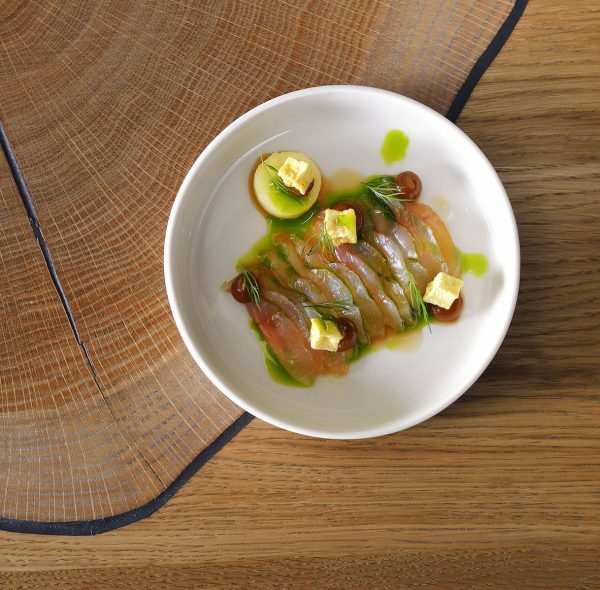 Presented minimalistically, the trout pink and skinless on a bed of bright green pureed kohlrabi, topped with toasted crunchy almonds, this was both surprisingly filling and moreish. A beautiful protein rich dish that felt perfect as a main. The wine to pair was a reisling, from 2009 by Miroslav Riha, a luscious golden wine that added to the soft trout wonderfully. The fifth dish, the second main, was a lovely dish of beef tongue with apple and horseradish. Presented exquisitely as if for the faint-hearted, this was reminiscent of a beef stew with fine premium quality chunks of beef, shallots and crackling, served in a hearty sauce, enlivened by hints of tangy horseradish and sweetened gloriously by licks of apple. The wine to pair was a rich red by Pavel Springer, a Cuvee Skale 2008. Before dessert, we had a tiny plate of decorated honeycomb to cleanse and prepare the palate for the final course – a curious touch. Our sixth dish was the final, offering an option of cheese or dessert. My guest opted for the dessert, whilst I had the cheese. Unlike your average cheese board, this was an elegant dish of blue cheese crumbled to almost a fine powder, served in a bowl with blake trumpet mushrooms and blueberries. The tiny portion was perfectly balanced given the potent strength of the blue cheese, which was delicious, and well paired with the delicate berries and savoury mushrooms. I had the Riesling Sharzhof 2015 by Egon Muller with this, the first of the sweet wines of the evening. Unlike the other wines, this was not a Czech creation, but German, with a lovely clear nose of citrus that cut through the cheese, and light, lush and slightly salty harmonising flavours with an excellent long finish. My guest had the dessert of yogurt with hazelnuts and potatoes, a seemingly odd yet satisfying combination sweetened by a Riesling from Michlovsky called Vlassky 2013. A multi-trophy award winner, this wine’s nose of spicy and honey, with its delicious vanilla and almost cognac like notes, made it a perfect addition to the otherwise more savoury dessert, gently enhancing it whilst allowing it to retain its more sophisticated flavours. To finish, we had a snip of the long trail of house made marshmallow called ‘Googoo’ as well as two chocolate filled fresh cherries and fresh apricots on a dollop of a peanut-chocolate tasting cream – another unexpected combination that didn’t fail to delight. Upon the close of our wonderful six course tasting menu – which in truth, was more of a ten or eleven course feast – we felt our stomachs well fed, our taste buds enlivened, our senses awakened, and our minds… a little over-excited from all the wine. But don’t get me wrong: the food here is a serious affair. 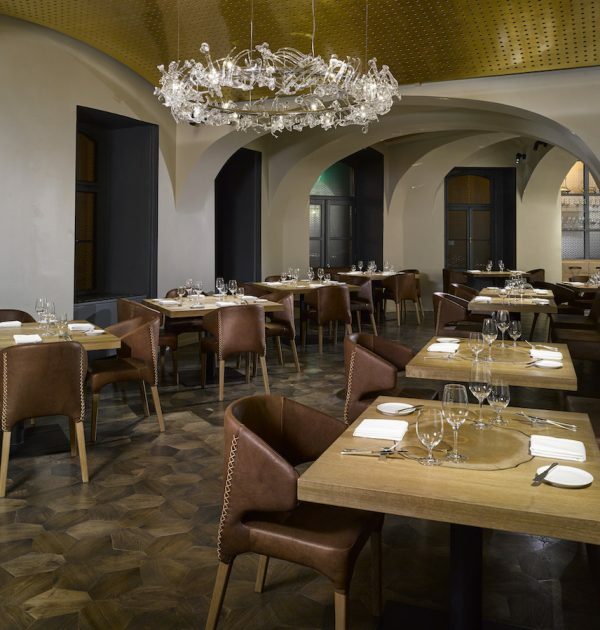 For a true taste of Czech cuisine in its finest, most galvanising glory, the tasting menus of La Degustation Boheme Bourgeoise are sure to impress. You must, must try this.